Jersey Boys is probably one of the biggest and well known Jukebox musicals. It had a significantly long run on Broadway from 2005 to 2017 and has garnered two U.S. tours. In 2014, Clint Eastwood (Yup...Clint Eastwood) directed a movie adaptation. In 2006 it was nominated for a plethora of Tony awards and even won four of them including Best Musical. I was extremely excited to see this show because of the style of music (and to take my mom who is a huge fan of the movie). I must say that it's a pretty amazing show with it's perspective of storytelling along with how it effortlessly weaves their hit songs into the story. Jersey Boys is based on the true story of how four boys living in New Jersey grew up and became one of the most well known quartets in musical history. The story revolves around the entire Four Seasons group and the book writers Marshall Brickman and Rick Elice let each one narrate a specific time in the groups climb to fame. The first part of the show (Spring) involves Tommy DeVito. DeVito narrates how the group came to be and even shows how he is the one who "found" Frankie Valli. The second part of the show (Summer) is narrated by Bob Gaudio and shows how the group began their rise to fame with the release of their first hit "Sherry." The group rapidly begins to pick up steam as they release more hits, begin appearing on shows like "American Bandstand" and really begin to see their careers take off however it isn't long until it begins to fall apart. As the first act closes, we see that Tommy owes a large sum of money to a gang. As "Fall" approaches, and the second act begins, we see Nick Massi take over the narration and shows how Tommy's ill decisions has put a large strain on the group. The group agrees (some more reluctantly than others) to pay off Tommy's debt, however Tommy must be sequestered in Las Vegas so the mob can keep an eye on him. While the strain becomes to much for Nick, he admits he wants out of the group and we move into the final part of the show, "winter." During this final period, we see Frankie Valli take the rains on narration and shows how he and Bob find replacements to keep the group a quartet. Soon it seems as if Frankie's life has finally taken a turn for the better as he pays off Tommy's debt but his daughter, Francine, dies from a drug overdose. The show ends with Bob Crewe narrating the original group members coming together for the Four Seasons' 1990 induction into the Rock and Roll Hall of Fame. As the lights fade out, each group takes a moment to explain sort of a "what happened and where are they now" moment. I think what makes this show so spectacular is the wide range of audiences it can reach. Parents and older generations will love hearing these hits that they grew up on while the show also takes the time to reintroduce an era of music to a younger generation. This was a similar that happened in MoTown: The Musical play as well. I think that's important and to bring it forward in such a unique way like this is amazing. The entire cast is pretty phenomenal. The show has a pretty small ensemble cast along with the main four actors playing the Four Seasons. Understudy Ben Bogen steps in for Frankie Valli and is an absolute treat to watch. His infectious energy and gorgeous falsetto, what Valli was known for, had the entire audience bopping their heads and tapping their feet. Corey Greenan plays the rough Tommy DeVito who's New Jersey dialect is flawless and oddly charming. Tommasco Antico plays Bob who landed quite the amount of funny jokes, and Chris Stevens as Nick Massi who really didn't have that much stage time compared to the other three. 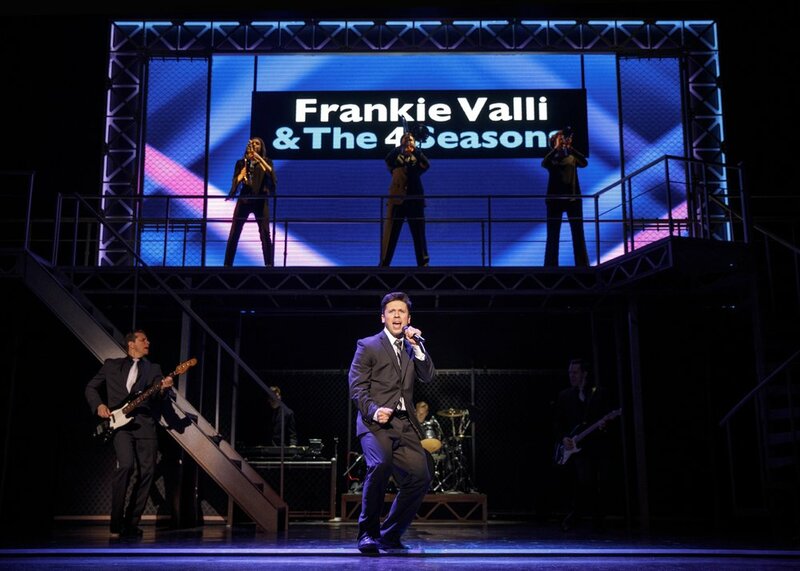 Jersey Boys is a great show for audiences of all ages. There is plenty of songs that no matter what generation you come from, you'll recognize it and instantly remember a simpler time in music. All of your favorite Four Seasons songs including "Sherry," "Walk Like a Man," and "Big Girls Don't Cry." The story is also a story that many of us know too well and it's the story of rags to riches. Let's be honest, we all love a great rags to riches story...especially with attractive men in suits who sing like angels and dance well enough to make me swoon in my seat.